Friday funny? 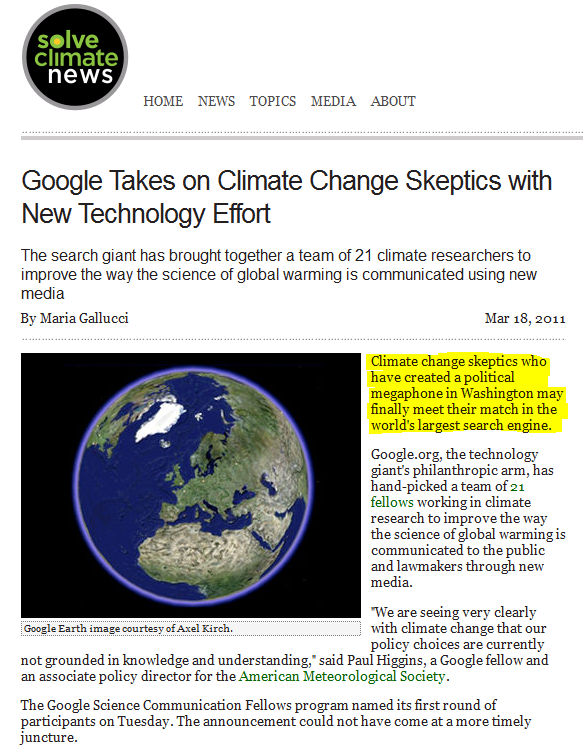 Google to take on climate skeptics | Watts Up With That? I’m not sure whether to laugh or not, but is this just one more reason to use Bing as a search engine without a climate agenda? Maybe we should make it the official search engine of climate skeptics worldwide? What next? Will we get the finger? I have been a Bing user for some time now…. Haven’t used Google is over a year. I wonder when the establishment will understand it’s the message that’s the problem, not the style of communication? Just read that article, and I must say that, given that site, the comments were surprisingly hostile. As I noted there, Bing is starting to look better all the time and Bill Gates is too smart to swallow the AGW line and has devoted his philanthropy to real issues. I wonder who controls Google. Lots of reasons to not use Google. This is just another. Count me in the Bing category too. Just wait until the become a victim of their own research, realize the issue is far from cut and dry. Can’t wait for that moment of realization! Being stupid is perfectly acceptable. Google has started investing in green energy. This is why. I’m deleting google, I don’t use Facebook (Obama financer) or twitter. I don’t need them, I don’t believe they are secure enough for my liking. Bing will do for the moment. I note also that http://www.google.com/corporate/execs.html ; John Doerr (a director of Google) is also a mover and shaker at Kleiner Perkins Caufield & Byers. “Putting a price on carbon is the most important thing we can do,” Silicon Valley venture capitalist John Doerr told reporters after the meeting of the president’s advisory board. Mr. Doerr, a partner at, Kleiner, Perkins, Caufield & Byers, is one of a number of tech figures who have invested some of the wealth they earned during the Internet boom in clean-energy ventures that could get a boost from the Waxman-Markey proposal. So it would seem that there are conflicts of interest at Google at the highest levels. Putting propaganda, censorship and profits ahead of democracy? Thanks for the heads up – From this moment on I’ve just become a Bing user…. Ok switched to Bing. Will drop Gmail but I have an Android phone synced to the laptop for contacts , phone numbers using the google system, what alternatives do I have? Let me guess… Global warming? I would use Bing, except its Microsoft. The only company I distrust more than Google is Microsoft. I won’t use Bing. That said, I’m truly laughing at Google on this one. This is the first true mistake I’ve seen out of that company. I’m thinking this is proof that the Dilbert principle is finally working it’s magic on that company, and the upper ranks of Google finally have some non-critical thinkers. “Then he said something he’s never said before: that is it because he’s committed to improving life for the world’s vulnerable people that he now believes that climate change is the most important challenge on the planet. Aaargh! Hadn’t heard that one, and haven’t heard anything more like that. Maybe someone at that meeting slipped some LSD in his mineral water and then forced him to watch the Copenhagen shock film a few times before speaking? Or maybe he has a wife problem like Arnold? I’m torn by this. I would like to boycott all google products, but OTOH there’s nothing cheaper, accessible and more comprehensive than YouTube to relieve one’s ‘tension’. What’s a man to do? Gogle should realize that they may well lose 50% clients because 50% don’t believe in it anymore. I now use yahoo. How many on these people are more activist than scientist? How many have known associations with environmental groups and organisations? You see that is the problem with such teams they all come with an agenda, they all come with baggage – none of them approach such matters with an open mind. Anyone else with a youtube account being forced to use Google mail? I refused and my youtube account is now gone for me.. I had a discussion with some brain washed college students about the global warming “problem”. I laid this out for them. “Okay, let’s just say I’ll give you global warming, that it is true, what do you want to do about it”? The answers were all many years away from being reality. So, I laid out a few things that can be done today, right now. 1. Add solar hot water heaters to all buildings. 3 to 5 year payback. Cuts electricity use by 25%. 2. Upgrade all lighting fixtures to use solar lighting and a centralized advanced technology light bulb for nighttime and cloudy days. 5 year payback. Cuts electricity usage by 15%. 3. Replace oil heaters for heating homes with a “green” alternative. Like hot water space heating, or a geothermal heatpump. There are many options here. 7 year payback. Saves many millions of barrels of oil per year. There are 8.1 million houses in the US that are heated with oil. These three by themselves have a huge payback in terms of electricity usage or oil utilization eliminated. The college students had zero interest in this because they could not do their little dances and repeat their little chants on “windmills” or “solar panels”. What I was suggesting wasn’t “cool” enough for them. Idiots. The supreme irony is that the “climate science” camp always talks about failure to COMMUNICATE the science and never about actually DOING the science. I doubt that there’s a single member of the Google Fellows who has ever had a brass-tacks graduate course in thermodynamics or signal and system analysis. And it’s the true soft-science believers–not the hard-core skeptics–that always have grants on their mind. Google is simply funding a theological camp. I have read a little of the Google article, but what is this Google “fellow”? Is he a jolly good chap, or a simple watermelon? Since I have been watching the posts on WUWT, I have learnt a great deal, but I have to say that there are only a few scientists who can prefix that nomenclature with “climate”. None are in the IPCC. One thing that does upset me, is that scientists such as Cox and Rose are being paid to counter the so-called sceptic motion. The BBC has a lot to answer. It would take a lot to push me to use Microsquat, but that did it. Bing here I come. Google you have become to big and arrogant, you should stick to the business of making money, not social engineering, choosing political sides or favoring only warmist AGW version of climate issues, given the sordid history of the Warming crowd that has been well covered on this site and the internet. There are hundreds of millions of us skeptics worldwide and we are growing like a tidal wave. Businesses like Google should always work under the maxim of the customer is always right or at least appear to be neutral, in other words Google keep your stinking nose out of picking sides, winners or losers. This has angered and alienated me no end! I have just converted all 3 of my home browsers and computers to Bing. and come Monday I will start with my company’s computers. Remember Google you ain’t the only game in town and we can and will leave you and every product you try to sell or introduce. It starts with a trickle into a stream, a stream into a river, a river into an ocean. Adios Google and I don’t mean see you later! I already tried to switch to Bing earlier this very day, but unfortunately it did much the same thing as I was trying to get away from on Google. Bing just says “including results for [something that has nothing whatsoever to do with what I was searching for],” which makes it sound nicer because it should also give me my real search results. Unfortunately, though, no matter how many pages I go through nothing resembling what I searched for shows up until I go through the same additional step of telling it that yes, I really am interested in getting results for the term or phrase I typed into the box rather than what they decided for me at random. Been using Bing since it took so long for google to index material on climategate. A Google fellow is, I believe, somebody like a fellow at the Grantham Institute at the LSE. 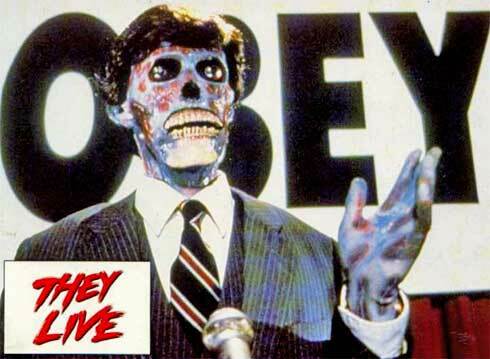 Basically, Robert Jerremy Grantham of GMO Boston pays their way. A bit of moonbattery there. I know RJGs sister is a medical doctor in the Caribbean, but really Jeremy, you need not use carbon taxes to pay for their stoves. Just get the local dictators to cough up the money. No science background. Sad. And yes, I do know him personally. Paul Higgins is 100% correct in this assertion. Our policy choices are not grounded in a full knowledge and complete understanding of the climate system, for the very good reason that this “Utopia” only exists in the minds of certain climate scientists who are too arrogant and too full of hubris to acknowledge that this is a science still in its’ infancy, and that many crucial uncertainties remain to be resolved. Until such a time that ALL climate scientists open their minds, and start analysing data in such a way as to let it drive their conclusions, instead of manipulating it and interpreting it such a way as to fit in with their pre-conceptions, then the entire science will continue to be mired in inadequacy. Does anyone seriously think, if it comes to it, that politicians will hesitate for a second to throw climate science “under the bus” in order to save their own skins? It wouldn’t hurt to leave some skeptical replies on the google article. So far there are quite a few. More would help. I have decided to go back to a previous favourite: Altavista. Yeah right and Bing isn’t leading to an non free, fully subjective internet in which you get dependent of all sorts of products and to Microsoft alliased organisations. Never will I go to Bing. Instead of whining here get your problems with Google to Google itself. Explain that these “scientists” are in no need of extra help and get yourself some help from Google in order to get an honest debate going. An honest debate is were this site is good at, or not? Sorry, but I don’t do Microsoft. I’ve absolutely no problem using Goooogle, outside under a couple of patio heaters. They’re free to do as they like. I get this feeling they are still acting under the assumption that people have still not heard of climate change. They’re still trying to raise awareness to a problem that everyone and their mothers dog is aware of. This smacks of Live Earth pt 2. I bet they won’t get much more traffic than Real Climate. The target demographic has already been defined and tapped by everyone else on the pro-warmist side. Heh. I stopped using Google in 2009. Spent a couple of weeks comparing search results from assorted engines, and saw how… _selective_ Google’s result were (Yahoo’s bias wasn’t so blatant, as I recall, but its returns weren’t particularly comprehensive; Bing was mediocre). These days, if I really need to research anything, I use a mix of engines. I don’t like Bing for some of the same privacy reasons that Google worried me about even before I saw the search results. NB- I did open open a Gmail account, not to use, but to prevent someone else opening one using a userid too similar to my name. I try to remember to log in sometimes, so it won’t lapse. It’s very strange when a computer company pushes a political agenda upon its customers. BING is an option. These fellows were elected from a pool of applicants of early to mid-career Ph.D. scientists nominated by leaders in climate change research and science-based institutions across the U.S. I have long considered Google to be evil (despite their motto, heh! ), and avoid using it directly. And I set my “home page” to “none”. Who really needs a home page, anyway? I have Dogpile set as my default search engine. It’s a search engine aggregator, and they don’t seem to have a political axe to grind. Dogpile does use Google, and Bing, as well as others. I have always been able to find what I’m looking for, if it exists. I have concerns regarding the big brother attitude and invasion of privacy manifested by Google such that I have not used Google for approximately 2 years. I don’t know much about Bing but have been using this as my main search engine for some time now and it seems to work OK.
As other commentators have said, there is something reprehensible about Google seeking to force their political views on others, and it would be some justice if this leads to free thinking individuals boycotting their services. That is about as alarmist as you can get. Wow ! This is sooooo applicable to current Lab/Green policy in Australia !!! Google as Goebbels! My, my. “We don’t know everything about the climate from a scientific standpoint and there are uncertainties, but they are uncertainties over whether climate change is going to either be bad or really, really bad,” – Andrew Dessler, also a Google fellow and a climate scientist at Texas A&M University. I humbly suggest duckduckgo for searching. It respects your privacy and has good results, along with some of the advanced features you’d expect from the bigger players. Safari offers only three options for default search engine (Google, Yahoo, Bing). You can add others, but apparently it takes some finagling. Did someone say Yahoo’s search engine has biases as well? If google wants to add its own slant to what I get to see, I have no interest in using google. I hope google will come to appreciate how lost trust is lost for ever. Be sure they have justified their decision. nothing google EVER gets onto any computer in my house. no search. no toolbar. no google desktop (although they DO try to automatically install with just about every application these days… even quickbooks!). Mostly because it’s a resource hog. That and they try to be all things to all people and know waaaay too much about you (me). Nor am I a fan of Big Blue, but alas, I need Microsoft to interface with clients 99% of whom use it. Maybe I’ll try one of those search aggregators. @ NC: I tried an android phone, but syncing outlook with gmail so I could sync with android was a pain and resulted in multiple duplicated contacts and calendars. Went with blackberry and never looked back. Loved my old Palm Treo, and it’s unfortunate that Palm never advanced that platform. I was downloading apps before the word “app” was cool. The Pre is (was) just a toy. @ Mods: Sorry, WUWT, but I like getting worldwide news on my home page first thing. But you’re on my favorite bar! Wish I could find a good news aggregator. Unfortunately, I don’t see anything remotely ressembling like that in Bing, so no Bing for me for now. Yes, it is disappointing that Google is also peddling this snake oil, but if I were to shut out of my life every convinced believer in AGW, it would make my life a lot harder. They are, after all, pervasive, and we have to live with them. I just avoid the topic with them. Sorry, but given a choice between Google and Microsoft, I’ll go with Google. I’ve never used Google, I’ve used Yahoo since their very first day. I do have to use some Google products at work, we have gmail for example, and on my Android phone of course, but that’s very little. Yahoo may have some search engine biases, but at least they aren’t out there funding a group to promote “knowledge and understanding” of the Climate Change Religion. That seems like a conflict of interest to me. How could they possibly provide a bias-free search engine? It will be interesting to see how the EU investigation turns out, especially after this. I don’t know what the outrage is about. Any search I do with words involving climate comes up with Wattsupwiththat at the top, followed by Climate Audit. I don’t understand what the bias is that people are complaining about. One more thing, I had no trouble adding my Yahoo mail to my Android phone. Well I can’t do anything about my g-mail; the company sets that; but google just got bingled into the dustbin of history. There are only really three search engines that are going to get meaningful results, Google, Yahoo and Bing (formerly MSN/Live search). If I could not use Google it would be Bing as Microsoft are the least likely to engage in political activism. The next biggest ones after that is the Chinese search engine Baidu and Ask.com. Unfortunately nothing beats Google for sheer indexing volume, speed and search options so I will continue to use it. Keep in mind just about every other search engine is powered by one of the top three (Google, Yahoo or Bing). I use Google, but I never click on paid links. I’m reasonably certain that over the years of taking advantage of their search enginge, that I’ve been a net drain to their bottom line. Use their bandwidth and search engines, use the snot out of them, just don’t pay them by clicking on anything they get paid for. eadler, what search term did you use to find WUWT at the top of the page? I tried “climate”, “global warming”, and “climate skeptics” [which improbably had Grist at the top of the page]. WUWT was nowhere to be found. Neither was Climate Audit. I have used Ask.com for last four years or so. See, I told you guys weeks ago that Google was rigging their search results to blackball WUWT!!! Hows about some props? Google can have their biased, jaundiced opinions, some of us search for the truth. If the truth hits a google fellow or a fellow of Google or whatever, how would he know it? They require sympathy and some sort of help to see the truth, in old age they’ll see the folly of their ways, life is an equaliser like that. How young firebrand Socialists become Republican or Conservative in middle age…..similarly so with eco-warriors, maturity provides perspective and proper evaluation, invariably, a chance too to recant. I thought Hansen was talking crap in the eighties, nothing has changed and google can’t change the world either, no matter how much they think they can, many people can smell BS a mile off, some see it early for others it takes a little longer but the polls on AGW and the public perception of the AGW scam is hardening, as the truth seeps out. Anthony, I highly suggest you talk with Pat Michaels at Cato about pursuing an anti-trust suit against Google on this issue. Props, Mike. Now use your intertubes-fu to come up with a way around it. Still waiting for eadler’s response to my question at 5:05 pm above. Google News is a good way to assess the probable market sentiment. They have loads of Huffington, none of WUWT. So i get to know what most market parcipitants will read. BTW: I have determined that if you google “climate blog” that WUWT comes up on the second page, while Climate Progress and Real Climate come up in the top five on the first page, despite them getting MUCH less traffic. I would use Bing, except it could find sand at the beach. Those who do everything do nothing well. I can find information faster on Microsoft’s own website with Google than with Bing. How sad is that? If you want to protest, use Yahoo! And don’t click on Google’s ads. By the way, what do I see at the top? “ads by google”. Also Google also owns Doubleclick ads. Wade, there is nothing wrong with Google Ads as they are completely safe and produce much needed revenue for “free” websites. Hm, IF say one were to set google as their home page and search for WUWT (only) everyday (or whenever they come here) and link to it from there, can anyone let me know if this has any results at all? Startpage and duckduckgo, has WUWT as third and fourth. Thanks to those that provided these search sites, not heard of them before, like ’em so far, booked and linked. So Google is in cahoots with the climate change crowd. Wonder what kind of deal they made. I tried to put a Google Earth placemark on Lake Korttajarvi where the Tiljander lacustrine sediment study was done. The one which Mann used upside down. They still haven’t put the placemark up. Yeah, searching for “climate blog” gets WUWT on page 2, but searching for “climate change”, WUWT is totally black listed from all results. Funny that. Any bets on how soon someone at Google gets around to blacklisting WUWT on “climate blog” too? They don’t need “new media”. They need to come out of the shadows and debate the skeptics. Google has a known bias. When Climategate was a hot topic, they blocked the word from “suggestions”. Just removed Google from my bookmarks. I’ll be using Bing, Yahoo, or whatever strikes my fancy. I think Google’s gotten too big for its carbon footprint. Google has been attacking privacy on the net and is now participating in the echo chamber effect formed by the mountains in the bay area. Of course it’s communications that’s the problem. I found Google’s blatant bias hard to believe at first, because I’ve been a great admirer of their technology. But when you do a search on “global warming skeptic” and get hits from huffington.post ,desmog.blog and nary a hit on wattsupwiththat, then the bias is clear. I feel like shouting “Say it ain’t so, Sergey and Larry!”. Big mistake on their part hiring professional “suits” to run their company. It seems that there has been I change. I tried searching just now, and found to my surprise that WUWT has been blackballed. It wasn’t that way earlier today. Google’s formula always put WUWT near the top. I guess this is their reaction to this latest WUWT blogpost, where there have been so many attacks by posters here on the integrity of Google, that they decided to blackball this web site totally. Do they have a right to do that? I don’t know, but it certainly is a good way to get back at those who have insulted and reviled them. Today, the House voted to defund NPR and PBS. I just dumped Google for Bing. They all had it coming, dipping too heavily into the polluted political well. Well, that does it. First they mess up their news page, and refuse to go back after thousands of complaints and nary a single compliment (http://www.google.com/support/forum/p/news/label?lid=06c20bed07a04da6&hl=en, see for instance the 6/30/2010 posting by Google employee Fred S–and the massive replies). Now this. I got tired of having to fight all the cookies. I’ve moved to Duckduckgo as a search engine. It defaults to safe, so you have to tell it to look in the larger world, but I’ve found more papers and books on subjects of interest than I ever did with Google. I worked for DEC back when AltaVista was THE search engine. Sad that it’s now so much about shilling. What’s your rationale for Google blackballing Climate Audit? Or the rest of the skeptic sites? “Global warming” has blogs like Wikipedia, the NY Times, the EPA, National Geographic, Climatehotmap, etc. “Climate change” has pretty much the same cast of alarmist characters. No skeptics’ sites at all on the first page, the 2nd page, the 3rd page, etc. When I got to the minor, thinly trafficked blog realclimate on page 5, I gave up. Still no “Best Science” site WUWT, or CA, or any skeptic site on the first five pages. And as we all know, people almost never go past the first page or two. Not if the adults find out. wsbriggs, if you don’t want to “fight” cookies (standard HTTP cookies are harmless text files) then disable them in your browser. The only problem is this may break the functionality of some pages. In regards to technology, I love using Google products. But I hate their politics. Remember when they kowtowed to Red China and censored their content? How about their ties to the Obama Administration? And don’t get me started on the privacy issues with Google. Google is headquartered near San Francisco and I think they have to be liberal or they would be in violation of local zoning laws. Before everyone gets hysterical over what is showing up in Google searches makes sure you are searching the page source of each result for the existence of search phrase. WUWT – search phrase does not exist. Nothing is being “blackballed”, Anthony has to add these key words to his site permanently to do better in those results. Google results are driven by the existence of key words, incoming link frequency and incoming link page rank. 1. Anthony needs to permanently add the key words to the main page he wishes to do rank higher on with Google searches. 2. More people need to link to WUWT from their own site. 3. More sites with a higher page rank need to link to WUWT. For example; CNN linking to WUWT would have more effect than 20 poorly trafficked blogs. Regardless every incoming link helps. Had a feeling this was coming after Google made a clumsy attempt at censoring or redirecting searches for “Climategate” when the news broke. Are we now looking at a newer, more polished version of Connelly/Wikipedia affair? Also web traffic numbers would have no effect on Google Results. There may be more people visiting WUWT but there are likely more websites with a high page rank linking to RealClimate such as newspapers, magazines, journals, science and news sites. Google has no way to know you are reading WUWT if you load it off a bookmark, type the URL in or have it set as your homepage. When I was doing research on infringement against one of my patents, I discovered that using all available search engines gave far better results than just relying upon Google. I still tend to use Google first, but use Yahoo increasingly. Bing ain’t bad, but I don’t like their news coverage as much. I also miss Altavista! Those were the days…. Google and Apple together can have a powerful effect. I set up this page to try and get some metrics on the Flash issue. But whats next? Chrome not even showing sceptics websites? For once I can vote with my feet! Google just dumped and trying out Bing. I would hope many others do the same. If you have fire bug, by fire fox you can right click on the header at the top of page, scroll down to Inspect element. What you will find from a little introspection when last updated to the banner photo, you included the words across the top into the JPG and lost these key words. Google is setting title header constraints to rank web site is correct in not seeing any of the old meta words in text format across the top of page, page header or first article title. IF you would add the search words you would like to be ranked by as text in the header, or as a fixed title in the first article. you will find your results in the top 2 or 3 again. April is doing a search term relevance sort for you, will post the top 25 words volume generated from all three search engines for your use to fix your problem as soon as the data is compiled. Then you can add the best sorted search term meta data to fix your problem. It is not “Just a Google political ploy” or an intentional ignoring of your volume, you just don’t have any meta data search able in the format they are looking for. It is simply Google is using the header TEXT and first couple of line to sort search result priority. Just fix your header text with the keywords of your choice, even as black text on black background so is invisible would work to fix your problem. Voting with my feet. I am stopped using Chrome as my default browser, and deleted google from IE9 and selected Bing as search engine. Might I suggest Ixquick for these very good reasons. “On June 27, 2006, Ixquick.com became the first search engine to delete private details of its users. IP addresses and other personal information are deleted within 48 hours of a search. Ixquick also does not share its users’ personal information with other search engines or with the provider of its sponsored results. As of January 28, 2009, Ixquick no longer records users’ IP addresses at all. Could I suggest instead of just changing your search engine, removing google from your browsers and closing gmail accounts, you actually write to google and tell them why you have taken this action? I will be writing to Google to tell them why I am switching my search engine. Also, let’s try to get this story into the media. So Al Gore is the Hitler of the 21st Century and Google the Joseph Goebbels. Google made the mistake of becoming a driver of political issues. Stick to business and technology and stop trying to manipulate the world and our minds. Because of this AGW link and coming after us skeptics (hunting us down really!) with a preconceived agenda and mind-set… for my part, I am dumping all “google” including search, igoogle and google analytics and google maps & earth. Too bad, the technology was quite good and now they’ve spoilt it. Not coming back until they listen to us too, bye-bye google. I have just changed my search engine to “Bing”. Google honed their craft in China. Wasn’t there something about “Big Money” vested interests interfering in the science? You could always type in Wattsup. Bing has the exact same type of ads as Google ads. Why do you think Microsoft is trying desperately (and pitifully) to get into the search engine game? Google makes their money off those ads, not off people using the search engine. The ads are placed in the page with the search results in such a way that Google know will interest people. The more competitive the search term, the high it costs the advertiser per click to be at the top. Microsoft wants that cash cow, and so they are trying their best to emulate that model. The first step is to get people to using their search engine. If you don’t click on the ads, Google and Bing make less money. I was pointing out the irony of protesting against Google while at the same time using Google to help fund this site and thus help Google do what you are protesting. Why not use the non-obtrusive Bing ads instead? I’m not anti-Microsoft. But when I use a search engine, I want to find things. That is why I will still use Google or Yahoo. That makes more sense but the way you phrased it was as if Google’s ads were in some way obtrusive. I am also well aware of Bing Ads. As for searching I still think Bing is better than Yahoo but nothing comes close to Google. I don’t care for Google or Microsoft. So I’ve been using http://startpage.com/ (also known as http://ixquick.com/) — which admittedly does include Bing results — and http://duckduckgo.com/. http://refdesk.com/ is worth a try for a homepage if you don’t want to use Google or WUWT. iGoogle.com let’s you completely customize your homepage and has no ads, just a G search field. Googlegate: The search engine may be standing up to Chinese censors. What about Google’s own censors? “enough” said: Gore was a “smuck”. We know what “enough” means. When referring to Gore, let’s get it right. Therefore, please put me in the “other than Google” search category. I’m still sniffing out Bing, and don’t consider Microsoft much of an improvement over Google. Dogpile is a metasearch engine and gets results from Google, Yahoo, Bing and Ask. The only real competitor to Google is Bing but it unfortunately lacks many search features that makes Google so versatile. Every time a new search engine comes out, I try it and they just don’t compare to Google. Bing is getting better though. Bing is also been good as Google is. Using Bing is always been great. WTF?? Do you know how search algorithms work? You search “climate blogs” and are surprised when websites with the word “climate” in their website name and URL appear higher in the results? It is worth noting that the Google Banner on the 20th Anniversary of the fall of the Berlin Wall was Sesame Street. The google mantra “Don’t be evil” just got flushed down the toilet. Now we have the choice between 2 evils: Microsoft’s Bill Gates and his malthusian view on population reduction, and google who is promoting a scam.